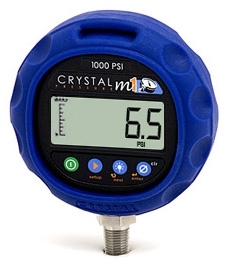 The M1 is a digital pressure gauge with 0.2% of reading accuracy. It competes directly with mechanical gauges. Accuracy is not degraded by dropping, over-pressure, rapid pressure changes or temperatures between -10Â°C and 50Â°C. One M1 gauge can replace up to five 0.25% mechanical gauges with an accuracy reading of 0.2%. 20% to 100% of Full Scale: Â±(0.2% of Reading). 0 to 20% of Full Scale: Â±(0.04% of Full Scale). 0 to -99.9 kPa (-14.5 PSIG): Â±(0.25% of Full Scale), where F.S. : -99.9 kPa (-14.5 PSIG). Display will flash at 110% of Full Scale. Operating & Compensated: -10Â°C to 50Â°C (14Â°F to 122Â°F). Storage: -40Â°C to 75Â°C (-40Â°F to 167Â°F). Description: 5 Full (seven segment) digits. Display rate: 4 readings per second. Numeral display height: 16.8mm (0.66") single line display. Pressure connection: 1/4 male NPT or G 1/4 B BSP. Liquids and gases compatible with 316 stainless steel. Battery: Two size AA (LR6) batteries. Battery life: 900 hours at 4 readings/second. Description: Water resistant housing incorporating o-ring seals. Polyester/Polycarbonate blend compatible with common industrial fluids, including Skydrol. Weight: 325g (11.5 oz. ), including batteries and protective boot. Piezoresistive silicon sensor with permanent oil isolation system and integral filter. 316 stainless steel welded (not brazed) sensor. No o-rings, thread tape, epoxy or sealant on any part of sensor assembly.